Key Difference: 3G, short for Third Generation, is the third generation of mobile telecommunications technology. On the other hand, broadband is a wide band of electromagnetic frequencies. 3G is a short from of third generation, which refers to an advanced wireless technology. It has additional features like high-speed transmission, advanced multimedia access and global roaming, than compared to previous wireless technologies. 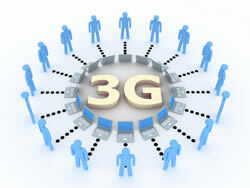 3G is mostly used with mobile phones and provide the ability to transfer both voice and non-voice data. Japan was the first to introduce 3G on a large commercial scale and later it spread to other countries. The enormous capacity and broadband capability are the most important features offered by third generation (3G). This plays a vital role in dealing with greater number of customers as 3G services cater both voice and data services. They also provide higher data rates at lower costs than compared to 2G (second generation). 3G networks enables user to download and use various apps, browse the web at a faster rate, send emails, videos and images, download and play 3D games and a lot more. It offers a download speed up to 3.1 Mbps (Mega bytes per second). In the early 1980s, 3G network was developed by the International Telecommunication Union (ITU). It was first released in the U.S. in 2003, with minimum consistent Internet speeds of 144Kbps (Kilo bits per second), but now there are so many varieties of 3G, that anywhere one can get an Internet speed of more than 400Kbps. Recently, 3.5G and 3.75G were released. It also provides mobile broadband access of several Mbit/s to smartphones and data cards in laptops and PCs. 3G is the best option for those who always want to stay connected to the Internet. 3G can also be used through data cards and dongles. Broadband refers to the wide bandwidth, that is it differentiates between the upper and lower frequencies in a continuous set of frequencies. It is typically measured in hertz and has a high speed internet access. The medium through which the transmission takes place can be coax, optical fiber, twisted pair or wireless. When the broadband came into existence, dial-up Internet access was the only means by which one could access the Internet and download files such as songs, movies, e-mails, etc. The cable modem was introduced in 1997, and until 2001 the broadband didn’t begin rising. However, in 2004, most average American households considered home broadband service to be affordable. It is basically a cable connection through which one will get Internet. The Pew Research Center’s Internet and American Life Project conducted a survey of adults in the United States to determine what percentage have made the transition from dial-up Internet access to the more modern broadband connections. The results are that broadband access has climbed to 70 percent, while dial-up remains steady at 3 percent. By using a broadband high-speed Internet connection, with data transmission rates many times faster than a 56K modem, users can view videos or download software and other data-rich files in a matter of seconds. 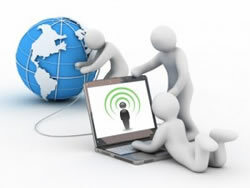 In addition to offering speed, broadband access provides a continuous “always on” connection (no need to “dial-up”) and a “two-way” capability that is, the ability to both receive (download) and transmit (upload) data at high speeds. However, differentiating between both the terms in a nutshell, one can say that both have been contributing to the telecommunication sector and proved to be very important for the internet and mobile telephone services. Both offer sufficient bandwidth to support various services like real time streaming and many more, and thus these technologies have already paved path for advanced technologies of the future. Of or using signals over a wide range of frequencies in high-capacity telecommunications, esp. as used for access to the Internet. Yes, the signal strength of not only 3G but any wireless network depends on the distance from its source.